Exploring cellular responses to stimuli using extensive gene expression profiles has become a routine procedure performed on a daily basis. Raw and processed data from these studies are available on public databases but the opportunity to fully exploit such rich datasets is limited due to the large heterogeneity of data formats. In recent years, several approaches have been proposed to effectively integrate gene expression data for analysis and exploration at a broader level. Despite the different goals and approaches towards gene expression data integration, the first step is common to any proposed method: data acquisition. Although it is seemingly straightforward to extract valuable information from a set of downloaded files, things can rapidly get complicated, especially as the number of experiments grows. Transcriptomic datasets are deposited in public databases with little regard to data format and thus retrieving raw data might become a challenging task. While for RNA-seq experiments such problem is partially mitigated by the fact that raw reads are generally available on databases such as the NCBI SRA, for microarray experiments standards are not equally well established, or enforced during submission, and thus a multitude of data formats has emerged. 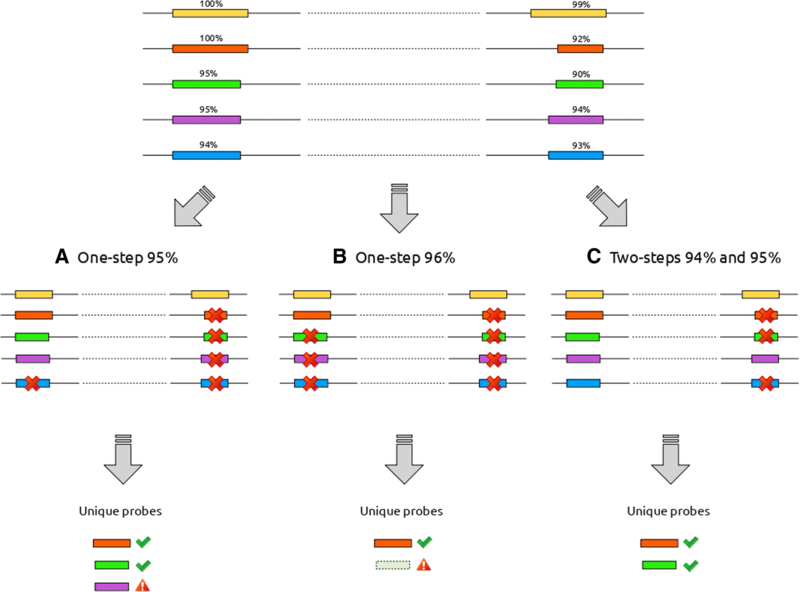 COMMAND>_ is a specialized tool meant to simplify gene expression data acquisition. It is a flexible multi-user web-application that allows users to search and download gene expression experiments, extract only the relevant information from experiment files, re-annotate microarray platforms, and present data in a simple and coherent data model for subsequent analysis. COMMAND>_ facilitates the creation of local datasets of gene expression data coming from both microarray and RNA-seq experiments and may be a more efficient tool to build integrated gene expression compendia. COMMAND>_ is free and open-source software, including publicly available tutorials and documentation. Transcriptomic studies started over 20 years ago with the first spotted microarray  while the first RNA-seq experiments appeared about a decade ago [2–4]. Since then the number of transcriptomic experiments performed has constantly grown, favoured, among other things, by the increase of technical quality and the decreasing prices . Nowadays large studies profiling expression of genes and their association with several experimental conditions are commonplace, and the wealth of public information is a huge help for scientific investigation. Nevertheless, most of the true potential for reuse and integration remains untapped because of the vast heterogeneity of such datasets and the difficulties in combining them. With the advent of systems biology, data integration emerged as a prevailing aspect to take full advantage of such rich sources of information . Several approaches have been proposed to fulfill the need to effectively integrate gene expression data and they can generally be categorized as being either direct integration or meta-analysis. The former directly consider the sample-level measurements within each study, and merge these into a single data set . Meta-analysis, on the other hand, integrates gene expression analysis combining information from primary statistics (such as p-values) or secondary statistics (such as lists of differentially expressed genes) resulting from single studies. Those studies combine the information from several data sources defining confidence levels subjectively for each individual study without a general scheme. Meta-analysis is a common method to integrate conclusions from different studies . Both approaches have been widely adopted and many tools have been developed to exploit or further analyse such datasets [9–13]. Regardless of the strategy used to combine and analyse a large amount of gene expression experiments, the first step in common with all these approaches is the acquisition of raw data. COMMAND>_ (COMpendia MANagement Desktop) is a web application developed in order to facilitate the creation and maintenance of local collection of gene expression data and have been successfully used to build gene expression compendia such as COLOMBOS  and VESPUCCI . It has been designed with flexibility in mind in order to deal with the disparate ways in which gene expression data are published, and to be easily extended to deal with new technologies. 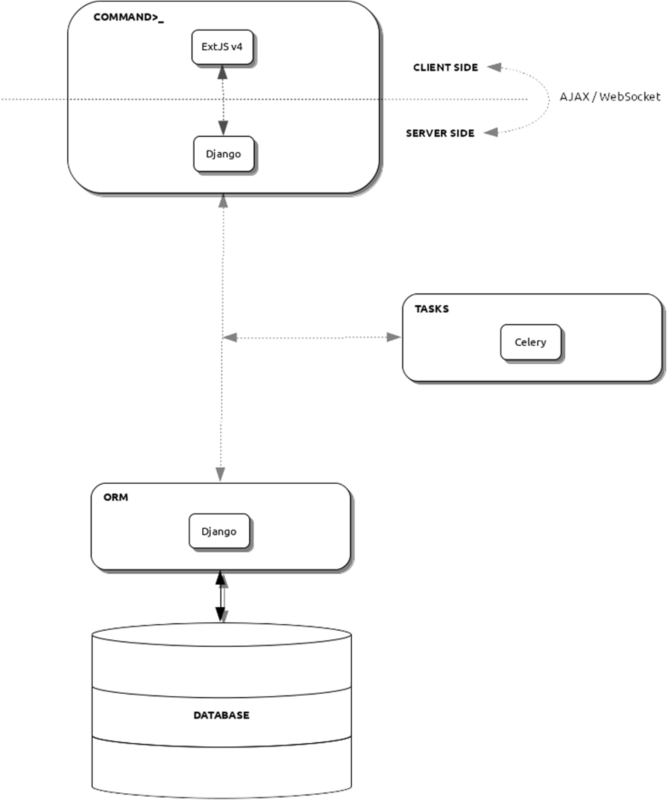 COMMAND>_is a multi-user web application developed in Python 3 using the Django 1.11 framework for the backend; the web interface has been developed using ExtJS 6.2 with a look and feel typical of desktop applications (Fig. 1). Despite being developed as a single page application, it allows users to navigate using browser buttons. By default it relies on PostgreSQL as Database Management System (DBMS), but the Django Object Relational Mapping (ORM) allows it be used with other DBMSs as well. COMMAND>_ uses both AJAX and WebSocket (via Django Channel) for client-server communications. WebSocket ensures a two-way communication between the web interface and a Python backend, easing the problem of continuously polling the server for updates on time-consuming tasks. Intensive tasks such as downloading and parsing files are managed asynchronously by the Celery task queue system so that many processes can run simultaneously (8 by default). COMMAND>_ is a complex application with several layers that work together. To ease the deployment process we provide a Docker Compose file, thus having a working instance is just a matter of running one configuration file. Since COMMAND>_ relies on several third-party software, performance depends in part on the specific software requirements. The default Python scripts are designed to keep the memory footprint as low as possible and scale linearly with respect to the input size, because many of them might run concurrently. The complete requirements list is available at the documentation page. COMMAND>_ has been designed to be adapted to different gene expression platforms and currently handles platforms of two kinds, microarray and RNA-seq, but can be extended to allow for more platforms to be managed. Gene expression data itself are modeled as one possible type of data that can be collected. By extending specific classes, as reported in the online documentation, COMMAND>_ can be adapted to potentially handle any kind of quantitative data. The basic concept behind the data model and how it is implemented in the database (Fig. 2) revolves around the idea that a set of measurements for several biological features (such as genes in case of gene expression data) are collected across different samples. The collected values might be direct or indirect measurements of such biological features and depends on the type of platform used in the experiment. In case of microarrays for example, each measurement refers to a single probe (a reporter in the data model) and thus it is an indirect measurement of gene activity. Samples can then be thought as a set of reporter measurements taken with a platform that is therefore a set of reporters. Biological features (as genes) and reporters (as probes) might have different properties (fields) such as name and sequence that can be used to couple the two entities. The three entities experiment, platform, and sample as well as biological features and reporters also hold meta-data, such as original ids, names and descriptions. 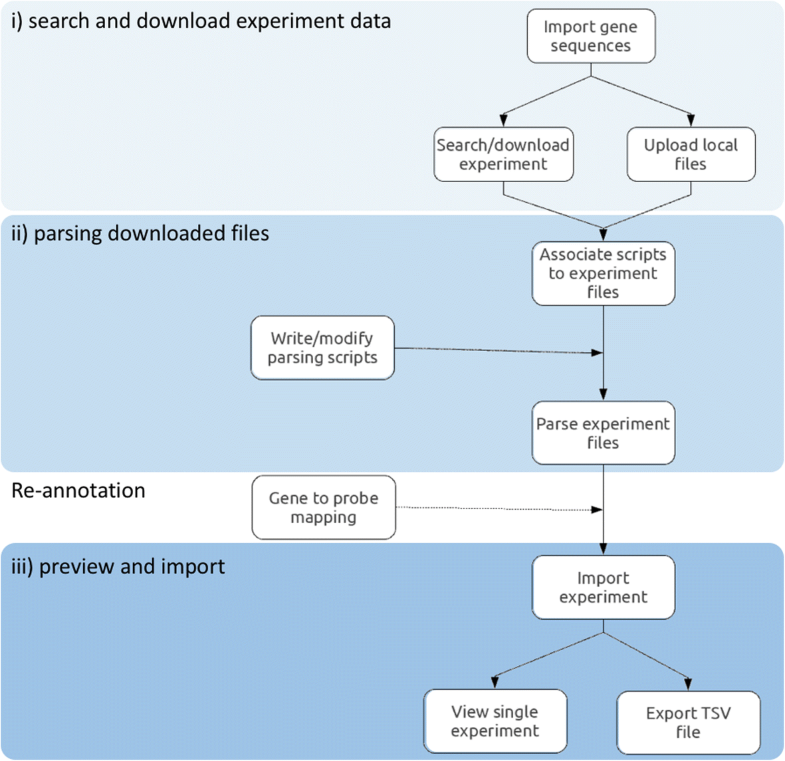 In this paper we present COMMAND>_, a web-based application used to download, collect and manage gene expression data from public databases. COMMAND>_ relies on a DBMS for data persistence and a set of customizable Python scripts to extract only relevant information from public gene expression databases. 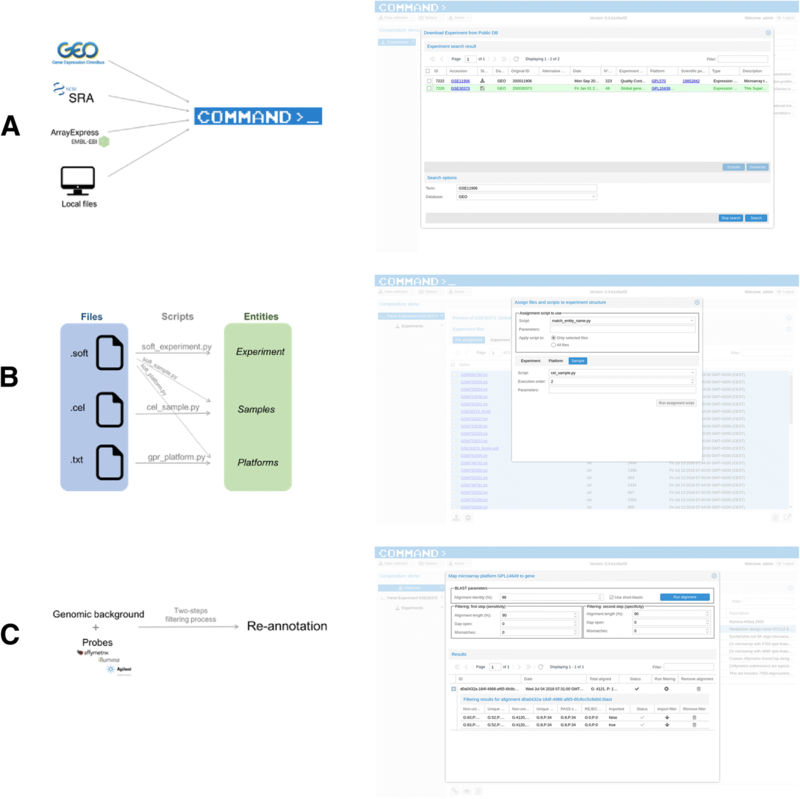 COMMAND>_ is a multi-user application that allow teamwork via definition of groups of users with specific privileges on each of the defined gene expression compendia. Moreover, it eases the long-time maintenance of such gene expression compendia storing a system log with all the relevant information about the operations performed. COMMAND>_ is a tool in constant development with new features to be added with newer versions. It is easily extendable to readily manage new technology platforms as they appear, for new data formats to be parsed, and even for new quantitative data types to be imported. This is reflected in the software architecture as well as in the data model. Operating systems: any supporting Docker Compose or Python 3 (tested on Linux). Authors would like to thank Andrea Cattani and Patrizio Majer for the IT support. This research was supported by the Autonomous Province of Trento (Accordo di Programma P1611051I). The funders had no role in study design, data collection and analysis, decision to publish or preparation of the manuscript. Documentation is available at https://command.readthedocs.io and a running demo of COMMAND>_ is available at https://command.fmach.it:4242. Gene FASTA file used in the case study is available at https://drive.google.com/file/d/1TJnsGnWdSjxhSlxgSe_au3X0E2Dc7nsx/view. Probe TAB file used in the case study is available at the Affymetrix Support site http://www.affymetrix.com/Auth/analysis/downloads/data/HG-U133_Plus_2.probe_tab.zip. The datasets used and/or analysed during the current study available from the corresponding author on reasonable request. KE and MM conceived the project. MM wrote the code and drafted the manuscript. PS, ABVA and KE tested the software and edited the manuscript. All authors read and approved the final manuscript. Gligorijević V, Pržulj N. Methods for biological data integration: perspectives and challenges. J R Soc Interface. 2015;12. https://doi.org/10.1098/rsif.2015.0571. Moretto M, Sonego P, Pilati S, Malacarne G, Costantini L, Grzeskowiak L, et al. VESPUCCI: exploring patterns of gene expression in grapevine. Front Plant Sci. 2016;7. https://doi.org/10.3389/fpls.2016.00633.